190 Davis Farm Road is a wonderful ensemble of oceanfront retreats at the end of a dead end road in a private, picturesque seaside setting. This lovely family compound includes a main house, a boat house with apartment, a seaside cottage, and a media room above the homeowners private wood shop. 190 David Farm Road is the perfect destination for families to reconnect or for a small group of friends to vacation together while still providing private, intimate spaces. The main house is a lovely, three-story contemporary home with comfortable, modern amenities. 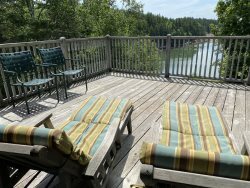 The first floor houses a very well equipped kitchen with stunning, panoramic views of Southwest Harbor, Long Cove and Deep Hole Cove, as well as a kitchen bar with two stools for coffee or a quick snack. The living room is a cozy sitting space that includes two built in window seats with views toward the water. On the opposite side of the kitchen is a grand dining room that seats 6-10 people. Off the dining room, there is a screened-in dining porch, and beyond that an expansive two-level deck. Enjoy outdoor sunning, reading and dining at a unique picnic table, which comfortably seats 12, built around an oak tree. The first floor also has a large linen closet with a washer/dryer, and a half bathroom. The second floor features the master bedroom with a king-sized bed, walk-in closet, and private balcony overlooking the deck below and views beyond. The master bathroom adjoins with a large, glass walk-in shower. The third floor, which is equipped with a full-size futon couch and a desk, is a great place to work or relax and features a walk out balcony with amazing views of land and ocean. The Boat House Apartment has a queen-sized bed, cathedral ceilings and a ¾ bathroom with a tiled shower. The apartment is sited to enjoy views around the point from the private deck. As you follow the network of paths that lead you from building to building or to different sections of beach, ledge and ocean, you will stumble upon a quaint Beach House on the tip of the peninsula. The gem of the property, this unique seaside retreat is wonderfully furnished with a queen-sized bed, cozy couches, a half bathroom and a screened deck with hammock. Arching pine ceilings complement wood floors and the rows of windows which let in dappled light. The last living space in this wonderful compound is a media room above the wood shop with a comfy sectional couch, a large screen television and DVD/VHS player. The property has several beaches and easy water access and is ideal for launching kayaks for an ocean adventure. The homeowners recently added a dock and float system for easy access to the ocean at any level of tide. 190 Davis Farm Road is an amazing vacation destination. Enjoy complete privacy and great ocean frontage at a tremendous location in Deer Isle, Maine. Inquire to reserve or to learn more about this premier property today. Wonderful week in a wonderful space...incredible!